Dear Abbey: Quit being so fat!!! – Abbey Co.
Dear Abbey: Quit being so fat!!! Dear Abbey, it’s time to quit being a fatass. If you are younger than 25 I am guessing you don’t even know who “Dear Abbey” is. Back in the day before the internet, people had to write into the newspaper to ask for advice, and “Dear Abbey” was a column you could write into. Imagine that; you couldn’t just hashtag #lifehack and find all the answers to your life problems. Anyways, as a joke in high school, some people would call me out as “Dear Abbey” and ask me for odd advice. Well, now it’s time for me to give myself advice. I have always struggled with my weight. In high school and my early twenties, I managed it with eating disorders. I expect that is a rather normal but extremely unhealthy thing for a young girl to go through, and luckily I outgrew that phase of my life without any terrible side effects. In my mid twenties, I managed with exercise. I didn’t love my weight, but I was okay with it. I mostly ran, and would do some occasional pilates. I was also very active and spent my weekends in the summer golfing, swimming, etc., and the winters I went snowboarding frequently. 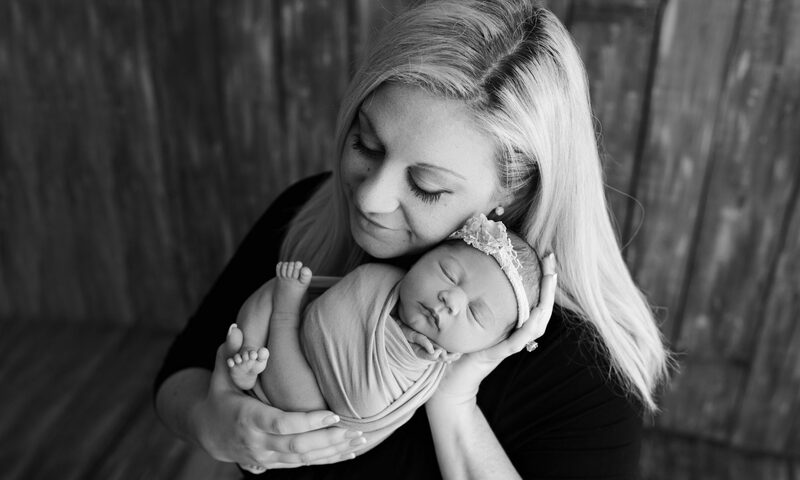 At 29, I got surprise pregnant with my daughter. 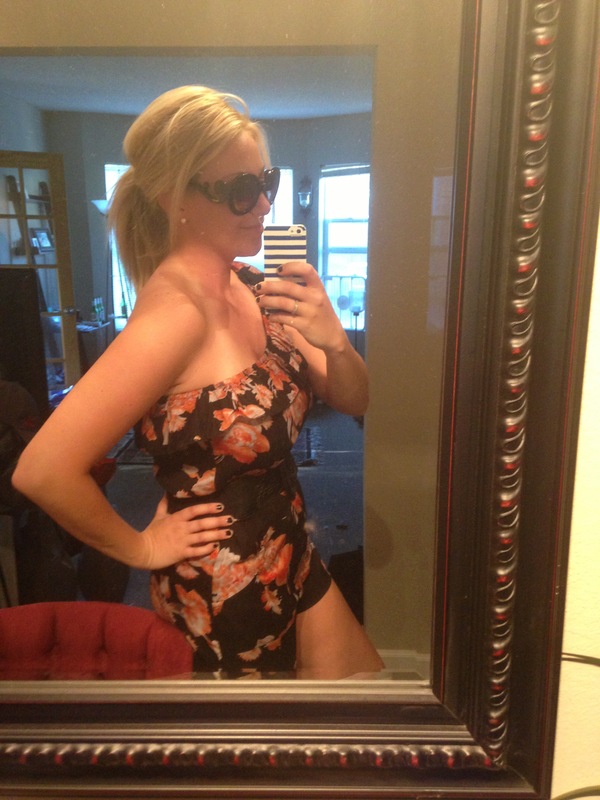 I gained about 32lbs with my pregnancy, which was more than I had wanted, but wasn’t so much that I was unhappy with myself since I know people who struggled with gaining a whole lot more. Within 6 weeks of having a baby, I was back down to my pre-baby weight. On maternity leave I was able to go for long walks during the day, pretty much every day which was nice. I was eating relatively healthy, making sure to not over eat, but didn’t have to watch this too much since my metabolism was in a good place thanks to breastfeeding. I was super proud of myself! Here I am. 25LBS heavier than I thought I could ever be… So super fat that I can’t even believe it. None of my jeans fit. 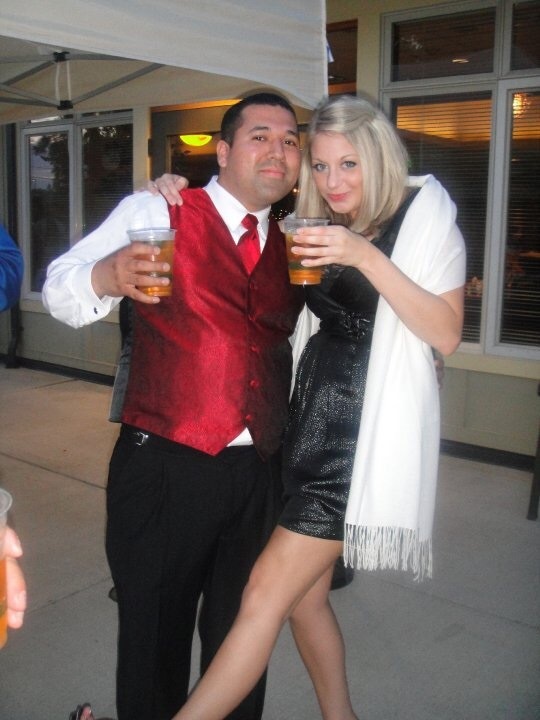 I got married almost 7 months pregnant and was 10 LBS LIGHTER than I am now. UGH. It never occurred to me I could loose control of my weight. My weight has always fluctuated easily, but with some light exercise and smart eating I could keep it within a range where I was happy. I look at pictures of myself now and just can’t believe that is me and am genuinely embarrassed. The dumb part is I KNOW WHAT TO DO! I know what it takes to control my weight and have done a good job of it in the past. So, I am going to rewind to my pre-baby days, take no excuses, and loose this weight and keep it off. I have to so that I can feel like myself again. I think the biggest thing I need to improve is my accountability. I tell my husband that I am going to eat healthy and work out, but often it doesn’t happen. Or it will happen and I loose 5 LBS, then we fall off the wagon on a pizza and beer night and I gain it all back. So, what better way to keep yourself accountable than on your BLOG which is public for the whole world to see!!?! Some people only blog about their weight loss journeys alone and I don’t intend to do that, but I do plan to blog more healthy meals, and weekly check-ins on my progress. So, day 1 of my journey, I am blogging this. For breakfast I had black coffee and gluten free cereal with skim milk. 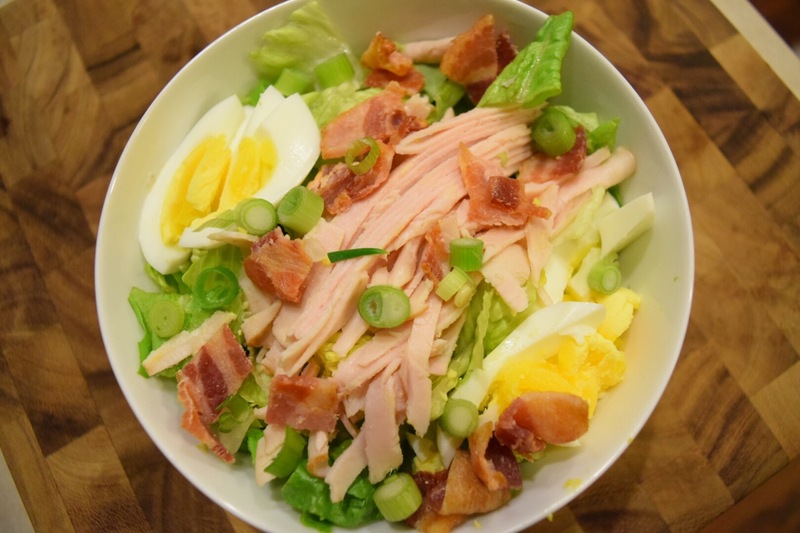 For lunch I made hubby and I delicious turkey bacon Caesar salads. For dinner, we are having protein bowls with brown rice, beets, chickpeas and green beans. I will do some Pilates tonight, and continue to find some time to exercise every day, even if it is only for a short period of time. My goal is to loose these 25 LBS and be happy with how I feel about myself again! Below are some motivational pictures for myself – what I looked like before these extra pounds. I am really glad I found your blog. I love reading your stories. Thank you for sharing and keep up the good work! Aw that is such sweet input, thank you! Its so great how we can connect with people in the blog world! So happy to have found your lifestyle blog. Day one sounded like a huge success in getting the whole family to eat healthy meals. I wish you nothing but success and look forward to following your blogging journey. I totally understand where you are coming from. But I promise you three things. 1. You are the most beautiful woman your husband and baby have ever seen. When you stand in the mirror and look at your extra weight, you see frustration. But your daughter sees who she wants to grow up to be. I promise that you will never regret trading dress sizes for leftover cheerios and baby kisses. 2. Your body is just as perfect as it was -25 pounds ago. It wakes up every morning and guides you through life. I promise you that your body isn’t your enemy and when you love it for all that is does, like dancing under the star, running to catch up with those you love, and carrying the weight of the world on your shoulders, you’ll find it easier to fight for it to be healthy no matter what the scale says. 3. I used to be a “fatass” and then I wasn’t. Did I lose the 25 pounds? Nope… I just forgave myself for them. And why? Because one day my daughter stood in front of her mirror and I heard her say… ” fatass” as she turned around. And that was what I taught her to think of her body. I promise you that your family hates hearing mean things being said about you, even more when you say them about yourself. The struggle is real. We know what we need to do, yet we still eat four of those delicious chocolate chip cookies that my 14 year old son just pulled out of the oven (yes…this happened just before I read your post). Anyway, one time I read something that talked about our “happy” weight. The one that was healthy, but also manageable. Where we don’t have to count out exactly how many carrots we can eat. We just eat the carrots. The weight where we can splurge when we want and it won’t wreck everything as long as we find the balance. I just try to live in that reality…my “happy” weight. So much of this resonates with me, especially as I start my trek to lose the baby weight after giving birth three weeks ago. Best of luck to you on your journey! You can do it! Us girls put so much pressure on our appearance. You’re a beautiful person inside and out. Keep doing what makes you happy and a gradual movement is the best kind! I gained 55 pounds with my son, he’s only 10 weeks old so I’m actually still 15 pounds over my prepregnancy weight. It’s frustrating because I’ve never been big, or overweight and here I am still unable to fit back in my jeans. But the weight is coming off, so long as I’m mindful and don’t over eat, breastfeeding and walks have helped be drop the first 35 pounds. Like you, I need to hold myself accountable for excersise. It’s ao difficult with baby in tow now, because I’d rather cuddle than excersise. But that’ll just make us both couch potatoes and I don’t want that. So happy you decided on meds for your post party depression, hope you feel better. The weight will come off in time, you’re off to a great start! You’ve so got this, girl! I am currently going through the same thing and it’s really disheartening, but I know we can do it. Thank you so much! I haven’t made much progress yet, but I’m working on it! Pingback: Meatless Monday BBQ Black Bean Burrito – Abbey Co.